Shelf Exposure goes something like this. We give writers a chance to go away and look over their shelves. They come back armed with a theme, a short list of books that match the same criteria. They've also been given a seemingly random list of requests: Show us a book with a circle on the cover. Show us a paperback that flaps nicely. Show us a book you'd never lend out. Show us a book that makes you angry. 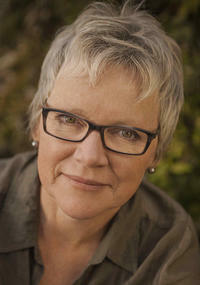 Jane Silcott, author of the personal essay collection Everything Rustles (Anvil Press) does just that, and more! Bring out your books! Show us your goods! Expose your shelf! About Everything Rustles: In this debut collection of personal essays, Silcott looks at the tangle of midlife, the long look back, the shorter look forward, and the moments right now that shimmer and rustle around her: marriage, menopause, fear, desire, loss, and that guy on the bus, the woman on the street, wandering bears, marauding llamas, light and laundry rooms. Why do some moments shimmer, while others fade into a quickly growing morass of "I can't remember?"